Back in January, a pair of Toronto teenagers launched the first Lego "astronaut" (the first we know about, at least) to the edge of space. 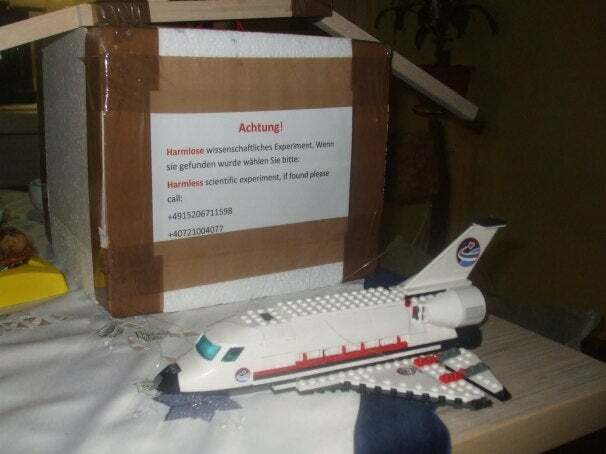 But another Lego hobbyist managed to one-up them: Raul Oaidia from Romania launched a Lego space shuttle into the stratosphere on the back of a weather balloon. Raul got some help from Steve Sammartino, a businessman who funded this Lego spaceflight. With Steve's help, Raul attached a Lego space shuttle model (set number 3367!) and a video camera to capture the voyage. According to Raul, he and his father traveled to Germany to launch the balloon, since that country's regulations on this sort of project are more relaxed than those in Romania. The launch took place on December 31, and the balloon with its Lego cargo flew to an altitude of about 35,000 meters (that's roughly 114,800 feet for those of us in the US). When the balloon returned to Earth, the shuttle was, incredibly enough, undamaged. Check out Raul's blog for the full story, and a list of the equipment he used to carry out the launch. Meanwhile, we can't help but wonder, what's next? A Lego satellite, perhaps? A Lego space probe? If you've got a similarly cool project you'd like to share, we'd love to hear from you.